The G24 is a grouping of some of the most influential developing countries in the World Bank and IMF. It includes G20 countries such as India, Argentina, Brazil, Mexico, and South Africa, and also Egypt, Iran, Nigeria and Venezuela, as well as a number of other countries. The G24 communiqué is traditionally the first statement of the meetings. This year’s communiqué of the Intergovernmental Group of Twenty-Four on International Monetary Affairs and Development (G24), released on 11 April at the World Bank and IMF Spring Meetings in Washington DC, highlighted that the IMF’s latest projections that moderate global growth will be uneven across emerging market and developing economies (EDMEs) and called for stronger global cooperation to address risks. After a US lawmaker threatened to delay the capital increase for the International Finance Corporation (IFC), the Bank’s private investment arm, due to concerns over accountability and transparency, the communiqué urged the “immediate adoption” of the IFC Resolution to implement its capital package, which includes more lending in fragile and conflict affected states. This is despite the IFC’s failure to address concerns about its poor track record on project performance in fragile and conflicts affected states (see Observer Autumn 2018), as highlighted by the Bank’s Independent Evaluation Group Results and Performance 2017 – a key focus of the capital increase package. It reiterated that “economic transformation and inclusive growth” are crucial for achieving the Sustainable Development Goals (SDGs), with a particular focus on jobs in emerging market and developing economies (EMDEs). The communiqué emphasised the need to strengthen domestic resource mobilisation in this regard as well, but stressed that relying on this alone was “not feasible” for achieving the SDGs. Notably absent was an explicit reference to catalysing private financing, a key feature of last year’s October communiqué. This comes amidst new evidence from the Overseas Development Institute calling the impact of Bank’s ‘Billions to Trillions’ agenda into question. Instead, the communiqué focused on the role of advanced countries in delivering on their Overseas Development Assistance and increasing concessional resources, with emphasis given to the “meaningful replenishments” of IDA19 (the International Development Association, IDA, is the low-income arm of the Bank) and the African Development Fund. The communiqué called on the World Bank and IMF to “intensify efforts to address climate risks” and highlighted the role of multilateral development banks (MDBs) to “support the scaling up of EDMEs’ investments in sustainable infrastructure.” This comes amidst longstanding civil society calls for the World Bank to introduce new measures to prevent its finance from going to fossil fuel investments (see Observer Spring 2019). The G24 noted the launch of the Coalition of Finance Ministers for Climate Action at the Spring Meetings, and urged that the Climate Investment Funds, which are hosted by the Bank, be “adequately resourced.” It urged developed countries to deliver on the $100 billion per year for additional financing to support EDME climate actions under the Paris Agreement. 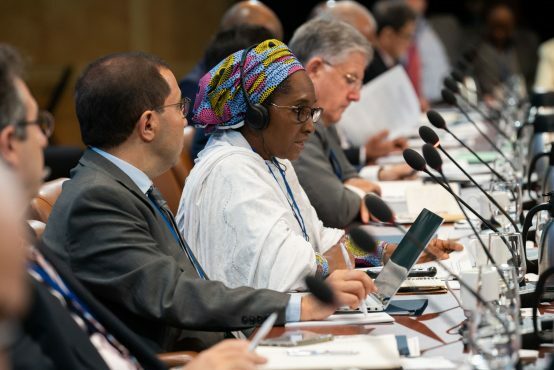 The G24 has continually called for greater representation for developing countries at the board level of the international financial institutions. In this year’s communiqué, although the G24 called on the Bank and Fund to strengthen efforts to “deepen the voice and governance reforms for the legitimacy of the IMF and World Bank”, it fell short of acknowledging the failure of the Bank Board to deliver a transparent, merit-based selection process of the new World Bank president, which was once again limited to a US candidate (see Observer Spring 2019). Instead, the group congratulated and welcomed new World Bank President David Malpass, thanking Kristalina Georgieva for her stewardship as Interim President. Reflecting on a new IMF paper on the global architecture of corporate taxation, the group called for “reform of the international tax systems rules and standards,” and highlighted that the “views of developing countries need to be central in the reform.” The communiqué called for a “multilateral solution”, but, as in last year’s communiqué, omitted any mention of call by the Group of 77 (G77), the United Nations coalition of 134 developing nations, for a UN tax body. Nonetheless, the G24 did call for strong international cooperation to address illicit financial flows (IFFs), praising the Bank and UN’s Stolen Asset Recovery Initiative and calling for an acceleration of the Fund’s work on IFF measurement.